Before 1773: son of a shibai jaya owner in the Dôtonbori in Ôsaka. He was a relative of Namiki Shôzô I's wife. He became a disciple of Namiki Shôzô I and received the name of Namiki Shôkichi. 17th day of the 2nd lunar month of 1773 : his master Namiki Shôzô I died. 1770s ~ 1780s: he became actor and a disciple of Asao Tamejûrô I. His stage name was Asao Shôzô. 9th lunar month of 1785: he took back the name of Namiki Shôkichi and worked as a zamoto in Ôsaka. 11th lunar month of 1787: he took the name of Namiki Shôzô II and worked as a sakusha, along with the tatesakusha Tatsuoka Mansaku, in Kyôto at the Nishi no Shibai on the kaomise drama "Koko ni Kiwamaru Gojin no Sonae". 2nd lunar month of 1788: premiere at the Ônishi no Shibai of the drama "Gishinden Yomikiri Kôshaku". A drama written by Nagawa Shimesuke I, Shôzô, Tatsuoka Mansaku and Shimada Tsuruzô. It was supposed to be staged first in Kyôto at the beginning of the month at the Nishi no Shibai but the theater was destroyed by fire the 29th day of the 1st lunar month. The troupe went to Ôsaka to perform at the Ônishi no Shibai and to celebrate the shûmei of Kataoka Nizaemon VII. End of the 1780s ~ beginning of the 1790s: Shôzô worked mainly in hama shibai. 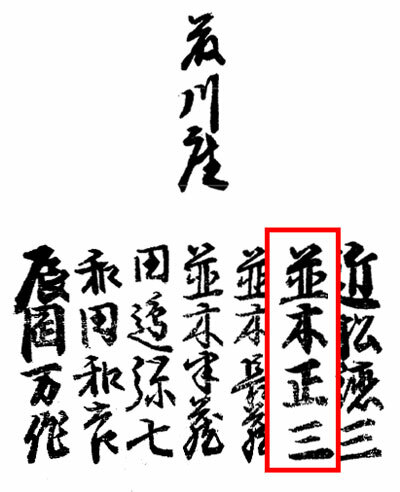 11th lunar month of 1794: Shôzô worked at the Naka no Shibai, along with Nagawa Shimesuke I and Nagawa Kunisuke, on the kaomise drama "Kana Utsushi Azuchi Mondô". 11th lunar month of 1795: Shôzô worked with Chikamatsu Tokuzô and Tatsuoka Mansaku on the kaomise drama "Ichiban Yari Tôkai Suzuri", which was produced by Fujikawa Hachizô III (who celebrated his shûmei) at the Kado no Shibai; others main actors were Nakayama Bunshichi II, Sawamura Kunitarô I, Arashi Hinasuke II, Arashi Koroku III, Nakayama Bungorô I, Yoshizawa Iroha I, Mimasu Matsugorô I, Yamamura Giemon II, Yamamura Tomoemon I and Asao Sennosuke. 4th lunar month of 1796: premiere at the Kado no Shibai of the drama "Hade Kurabe Ishikawazome", written by Chikamatsu Tokuzô, Tatsuoka Mansaku and Shôzô [more details]. 7th lunar month of 1796: premiere of the play "Ise Ondo Koi no Netaba", which was written by Chikamatsu Tokuzô, Tatsuoka Mansaku and Shôzô in Ôsaka at the Kado no Shibai [casting]. 10th lunar month of 1796: Shôzô worked at the Minamigawa no Shibai, along with Tatsuoka Mansaku, on the kaomise drama "Ebisu Daikoku Megumi no Kurairi", which starred Ichikawa Danzô IV, Yamashita Kinsaku II, Asao Tamejûrô I, Nakayama Bunshichi II, Anegawa Shinshirô III, Yamashita Yaozô I and Ichikawa Danzaburô IV. The troupe moved to the Naka no Shibai in Ôsaka in the 11th lunar month to perform the same program for 10 days. 11th lunar month of 1803: Shôzô worked at the Kado no Shibai, along with Chikamatsu Tokuzô, Nagawa Tokusuke I and Segawa Jokô II, on the kaomise drama "Hatsu Yagura Kogane no Manmaku", which was produced by Nakamura Noshio III. The troupe moved to the Kita no Shinchi Shibai in the 12th lunar month to perform the same program for 10 days. 7th day of the 4th lunar month of 1804: his master Asao Tamejûrô I died. 11th lunar month of 1805: Shôzô worked at the Minamigawa no Shibai on the revival of "Yoshitsune Senbon Zakura", which starred Nakamura Utaemon III, Bandô Hikosaburô III, Arashi Sangorô III, Asao Kuzaemon I, Ichikawa Ichizô I, Asao Tamejûrô II, Ogawa Kichitarô III, Asao Kunigorô III, Nakayama Shinkurô III, Yoshizawa Iroha I, Fujikawa Tomokichi I, Nakamura Daikichi I, Nakamura Kumetarô II, Fujikawa Katsujirô, Yoshizawa Sakinosuke IV and Nakamura Motozô. The troupe moved to the Naka no Shibai in the 12th lunar month to perform the same program. 25th day of the 7th lunar month of 1807 : Shôzô died. Namiki Shôzô II was a Kamigata sakusha and a relative of the more prominent playwright Namiki Shôzô I. Though none of his surviving plays were prominent ones, he was said to be the author of "Kezairoku", a Kabuki playwriting manual which was published in 1801. His most notable contribution was his participation in the creation of "Ise Ondo Koi no Netaba" under the supervision of Chikamatsu Tokuzô and Tatsuoka Mansaku. The 25th day of the 7th lunar month of the 4th year of the Bunka era was the 28th of August 1807 in the western calendar.